I’m Nick, and I’d love to help you achieve your health, fitness and weight loss goals! I grew up as a farmer, where the culture has always been to help and support each other as a community no matter what. This would mean that whenever somebody was not able to perform a task or was in need of advice there was always somebody there to help. This is how my personal training works, we are a team as I will only be happy if I have managed to help you succeed. I want you to achieve your goals as much as you do! I understand how hard it can improve your fitness, as this is something that I am constantly going through whilst training myself. I do this not only because I love it, but I also believe that I could not be there to support and encourage you, if I did not understand how you’re feeling and what you’re going through. Focusing on strength training, functional movements and high intensity exercises, I have found that not only my clients have got closer to their goals, but they have also found that all sorts of day-to-day tasks become so much easier. Most of all, I aim to make the sessions fun for you, as if you are having fun, it will not feel like work! I have always wanted a career, which was not desk based and could help people. That mixed with a huge passion for sport and fitness was the driving force behind my decision to become a personal trainer. I have a background in combining powerlifting with circuit training. Using this combined training method has meant that I have learnt how to increase strength whilst also increasing endurance; it is also great for when it comes to loosing weight. 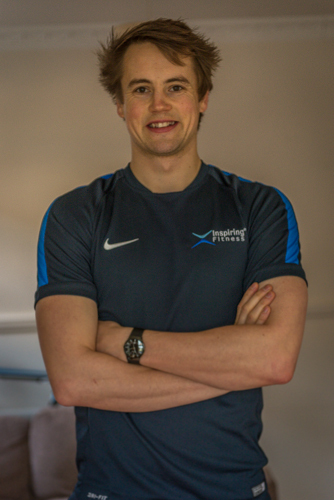 I was training to join the military in 2014, however a lower back injury sadly meant that I was no longer eligible, so after a period of physio and a huge amount of training to recover, I decided that personal training was the route to go. It covered everything I wanted to achieve and meant that I may get the opportunity to help people like you build up strength, just like I had to whilst training and going through physio. I have always been heavily into sports and fitness throughout school and university, regularly playing rugby, hockey, cricket and men’s lacrosse. I ended up playing Lacrosse for Devon as the pinnacle of my sporting career. I qualified as a personal trainer in June of 2014, as a level 3 personal trainer, and also included aspects such as High Intensity Training, Suspension Fitness and Boxing. I have been powerlifting combined with circuit training for about 2 years now, which has completely changed my idea of fitness. I now no longer strive for the beach body; instead I try and achieve a new personal best in everything I do. This is something I try to get my clients to do as well, because when you are strong, fit and healthy, looking good will naturally come. I have also got qualifications in nutrition, which have helped me not only change the way I look at dieting, but has helped my clients achieve results which they had been really struggling at for a long time. This is by focusing on changing eating behaviors rather than just cutting out individual foods, I also make sure that I explain why everything is been done so that you can understand, and take an active interest in improving your diet. I am a mobile Personal Trainer based in South West London, able to cover Fulham, Battersea, Clapham, Chelsea, Wandsworth, Putney Brixton and Balham. I provide my personal training services at an average of £50 per session.